Since using Marsello, RK Collections Boutique have seen an increase in sales by 8.8%. They are using win-back and abandoned cart emails. Founded in 1985, the team at Arkansas-based apparel store RK Collections Boutique (RKCB) know a thing or two about running a successful online store alongside their bricks-and-mortar business. Their commitment to customer experience and prioritizing the needs of their customers give them results to rave about. With a 100% online customer satisfaction rating, RK Collections’ online store is the crème de la crème of combined customer service and awareness. RK Collections are customer focused, and the results are clear. With Marsello as their handling their marketing and all of the Marsello tools switched on, the RKCB team are getting consistent results and tons of customer input. From using automated email flows alone they have seen a 20% increase in sales, and with a constant stream of feedback and statistics from Marsello, RK Collections are set to keep delivering the best customer service and store experience they can. Outstanding customer service is the key to having customers return; when customers have a great experience at stores, they want shop there again, and they may even tell their friends about the amazing experience they had. RK Collections Boutique understand this and use Marsello to say 'Thank you' to their first time shoppers with an automated email which includes a special coupon, incentivising customer to come back a second time and make a purchase. Since enabling this feature, RKCB have seen a notable increase in their sales relating to return shoppers who have received 'thank you' emails. With customers feeling appreciated and RKCB automatically increasing sales, it's a true win-win. RK Collections aren’t just rewarding their frequent customers; they’re winning back shoppers from carts left behind and customers who haven’t shopped within the last 30 days. With a customer win-back rate of 7.4 percent, their email communications are a powerful marketing tool. Check out one of their lapsed customer emails below which pulls through product recommendations and also offers a discount coupon to entice customers to shop again. 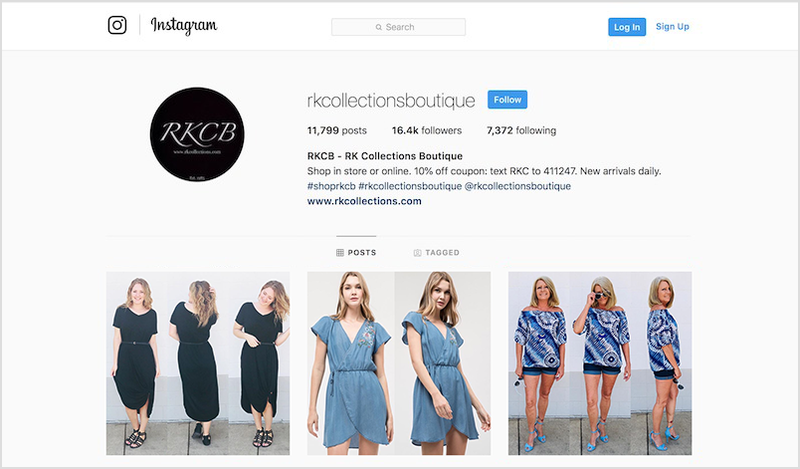 The RK Collections team know the power of social media marketing and actively drive followers to their both their brick-and-mortar store and online store with frequent updates. Their Twitter is brimming with links to their Instagram account and online store, alerting followers to special deals and online exclusives. Meanwhile, their Instagram is full of style ideas and clothing combinations which show that RKCB is a store which can cater to a diverse range of people.